Another busy and interesting year for CGI visualisations - Rolls Royce, Interactive imagery, dogs' homes and more! From the ashes of the terrible fire in 2014, in which 50 dogs died, comes a new, state of the art facility. 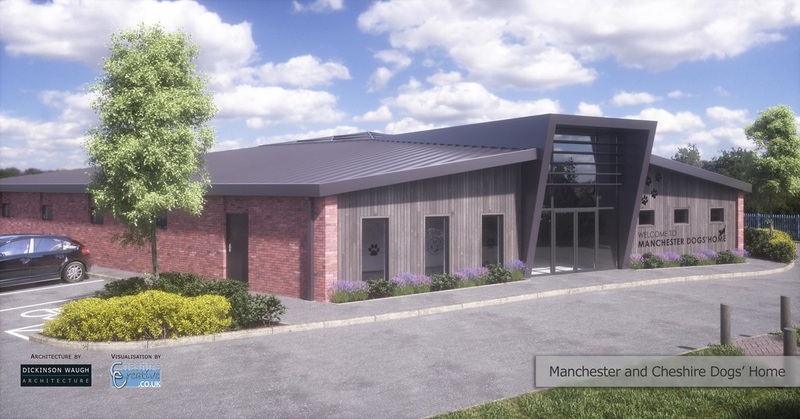 Designed by Dickinson Waugh Architecture of Knutsford, our visualisation shows the striking architectural design which will cater for over 30 dogs. Many of the dogs rescued from the fire were moved to other sites, including Cheshire Dogs' Home, near Warrington. For more details, see the Manchester and Cheshire Dogs' Home website. Watch this space for an interactive 360 degree CGI visualisation of the interior coming soon! We've added a new dimension to 3D CGI Visualisations. Countryside Properties needed a more immersive way to present their design for a group of apartments in Manchester. Click on the image below to see our solution. Have a play - drag the mouse cursor or swipe on a tablet to look all around. You can even zoom in and out! Using our accurate modelling software we created a sun path analysis of the latest proposed development by Countryside Properties. Local Planners wanted to see how the existing houses would be affected by the proposed design. We produced 4 sun path analysis movies to demonstrate where the shadows would fall at different times of year. ​Shown below is the day of the Winter Solstice animation which is accurate for the exact geographical location of the development. Our CGI visualisation photomontages are a very useful tool for understanding the way a proposed design will work in it's environment. When Knutsford based Dickinson Waugh Architecture were commissioned to develop Brae Cottage in Knutsford they came to Cheshire Creative to help with the visualisation process. Interestingly, Brae Hall has a fascinating history, being what could be described as the birthplace of Rolls Royce. Sir Henry Royce began tinkering with cars here which led to the creation of the Rolls-Royce legacy. Cheshire Creative Ltd have been creating high quality, photorealistic, computer generated illustrations and animations since way back in the mid 90s. Based near Warrington, our mix of ‘cutting edge’ technology and artistic flair helps keep us at the forefront of the 3D CGI visualisation industry. The vast majority of our work is repeat business and through word of mouth, a testament to our quality, service and prices. If you need artist's impressions of anything, please get in touch on 01925 751683.